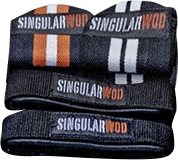 Pair of Olympic bar holders compatible with our Singular WOD Racks and Yokes. J-Cups for rack and yoke are a pair of 50-mm stands for Olympic, fitness or powerlifting bars to use with our racks (except the 80-mm folding racks). Made from structural steel with a stove-lacquered powder paint coating finish, they are capable of supporting the weight of a bar at maximum load. They have 2 pieces of low density nylon to prevent premature deterioration while protecting the bar from friction with the metal part of the bracket. Other material: Includes UHMW protection for the bar. Wall brackets for 3, 6, 9 and 12 Olympic, fitness or powerlifting bars. Keep your gym tidy while using minimal space. It allows 2 athletes to use it at the same time and when anchored to the floor it provides the maximum security even with heavy loads. A box in your own garage: bar holder, pull-up bar (including two skinny and two fat bars) and safety bars for squats.